This final report from LSRP is the culmination of seven years of research and advocacy for national planning for diocesan priests. 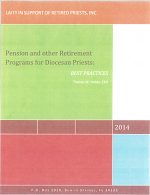 This document presents LSRP’s suggested best practices to guide dioceses in developing and improving their programs for priest retirement. This report to all Bishops of Catholic Dioceses in the United States has been prepared by Laity in Support of Retired Priests, Inc. (LSRP), a non‐profit organization, through a grant from the Retirement Research Foundation, based in Chicago, Illinois. LSRP commissioned CARA to conduct a follow-up study of diocesan practices and policies for the long-term care needs of diocesan priests in retirement. This study, released in May 2014, presents findings from interviews with diocesan personnel in 29 dioceses that provide some sort of long-term care for priests. This PowerPoint presentation on requirements for retirement adequacy for diocesan priests was presented at the annual meeting of the National Association of Church Personnel Administrators (NACPA) in April, 2014. This is an article entitled “Best Practices for Priests Pension Plans” from the March 2014 issue of GRS Journal, published by Gabriel Roeder Smith & Company. “Understanding Catholics Today and the Context of Vocational Choice: Annual Meeting.” This is a PowerPoint presentation by Fr. Thomas Gaunt, S.J., CARA executive director for the February 2014 board meeting of LSRP. This is a summary of findings and suggestions from a pilot study of the U.S. dioceses and the advocacy of their existing retirement plans for meeting the future retirement needs of the priests. Report prepared by Gabriel Roeder, Smith & Co. for LSRP. This program manual is designed to be used as a template for dioceses that are interested in establishing a special collection in parishes for diocesan priest retirement. This is a national study of U.S. dioceses to learn about the types of arrangements that are in place to assure that priests have access to certain healthcare and related support services needed in retirement. The study was conducted by CARA in 2013 for LSRP. This report was produced by Gallagher Benefit Services Inc. in response to LSRP’s request for assistance in the development of a model program for a minimum, equitable, uniform pension and benefit plan for retired diocesan priests. This is a Special Report on issues in retirement for diocesan priests prepared by CARA for LSRP. The report summarizes findings from a national survey of active and retired priests that was conducted by CARA in 2009. This is a model of a pre-retirement planning manual prepared by LSRP to serve as a resource for dioceses interested in enhancing the foundation provided to their priests as they contemplate and prepare for retirement.